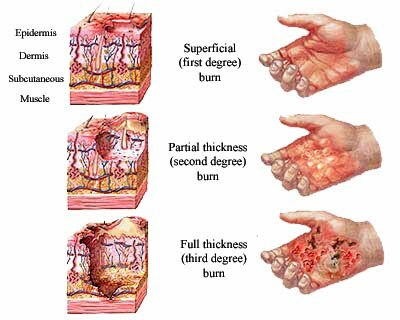 Deep partialthickness burns (similar to seconddegree), such as a scald: The epidermis and upper to deeper portions of the dermis are injured. The client has a deep partial-thickness injury to the posterior neck. Which intervention is most important to use during the acute phase to prevent contractures associated with this injury? Place a towel roll under the client's neck or shoulder. Keep the client in a supine position without the use of pillows. Have the client turn the head from side to side 90 degrees every hour while awake. Keep the client in a semi-Fowler’s position and actively raise the arms above the head every hour while awake. The function that would be disrupted by a contracture to the posterior neck is flexion. Moving the head from side to side prevents such a loss of flexion. The RN has assigned a client who has an open burn wound to the LPN. Which instruction is most important for the RN to provide the LPN? Administer the prescribed tetanus toxoid vaccine. Assess wounds for signs of infection. Encourage the client to cough and breathe deeply. Wash hands on entering the client’s room. Infection can occur when microorganisms from another person or the environment are transferred to the client. Although all the interventions listed can help reduce the risk for infection, hand washing is the most effective technique for preventing infection transmission. The family of a client who has been burned asks at what point the client will no longer be at greater risk for infection. What is the nurse’s best response? Intact skin is a major barrier to infection and other disruptions in homeostasis. No matter how much time has passed since the burn injury, the client remains at high risk for infection as long as any area of skin is open. increase edema in the arms. increase the amount of scarring. decrease circulation to the fingers. A client who has had a full-thickness burn is being discharged from the hospital. Which information is most important for the nurse to provide prior to discharge? The client with a full-thickness burn is being discharged to home after a month in the hospital. His wounds are minimally opened and he will be receiving home care. Which nursing diagnosis has the highest priority? Recovery from a burn injury requires a lot of work on the part of the client and significant others. The client is seldom restored to his or her preburn level of functioning. Adjustments to changes in appearance, family structure, employment opportunities, role, and functional limitations are only a few of the numerous life-changing alterations that must be made or overcome by the client. By the rehabilitation phase, acute pain from the injury or its treatment is no longer a problem. The burned client's family ask at what point the client will no longer be at increased risk for infection. What is the nurse’s best response? Intact skin is a major barrier to infection and other disruptions in homeostasis. No matter how much time has passed since the burn injury, the client remains at great risk for infection as long as any area of skin is open. When should ambulation be initiated in the client who has sustained a major burn? Regular, progressive ambulation is initiated for all burn clients who do not have contraindicating concomitant injuries as soon as the fluid shift resolves. Clients can be ambulated with extensive dressings, open wounds, and nearly any type of attached lines, tubing, and other equipment. The burned client relates the following history of previous health problems. Which one should alert the nurse to the need for alteration of the fluid resuscitation plan? It is likely the client has a diminished cardiac output as a result of the old MI and would be at greater risk for the development of congestive heart failure and pulmonary edema during fluid resuscitation. The nurse should teach the community that a minor burn injury could be caused by what common occurrence? Minor burns are common occurrences. The use of space heaters can cause a fire if clothing, bedding and other flammable objects are near them. Chimneys should be swept each year to prevent creosote build-up and resultant fire. Burn injuries do not commonly occur from microwave cooking, but rather when taking food from this oven. Lastly, sunscreen agents are recommended to prevent sunburn. What is the priority nursing diagnosis during the first 24 hours for a client with full-thickness chemical burns on the anterior neck, chest, and all surfaces of the left arm? During the emergent phase, fluid shifts into interstitial tissue in burned areas. When the burn is circumferential on an extremity, the swelling can compress blood vessels to such an extent that circulation is impaired distal to the injury, necessitating the intervention of an escharotomy. Chemical burns do not cause inhalation injury. The client with open burn wounds begins to have diarrhea. The client is found to have a below-normal temperature, with a white blood cell count of 4000/mm3. Which is the nurse’s best action? These findings are associated with systemic gram-negative infection and sepsis. To verify that sepsis is occurring, cultures of the wound and blood must be taken to determine the appropriate antibiotic to be started. Continuing just to monitor the situation can lead to septic shock. Increasing the temperature in the room may make the client more comfortable, but the priority is finding out if the client has sepsis and treating it before it becomes a shock situation. Increasing the rate of intravenous fluids may be done to replace fluid losses with diarrhea, but is not the priority action. During the acute phase, the nurse applied gentamicin sulfate (topical antibiotic) to the burn before dressing the wound. The client has all the following manifestations. Which manifestation indicates that the client is having an adverse reaction to this topical agent? Gentamicin does not stimulate pain in the wound. The small, pale pink bumps in the wound bed are areas of re-epithelialization and not an adverse reaction. Gentamicin is nephrotoxic and sufficient amounts can be absorbed through burn wounds to affect kidney function. Any client receiving gentamicin by any route should have kidney function monitored. Which clinical manifestation indicates that the burned client is moving into the fluid remobilization phase of recovery? The “fluid remobilization” phase improves renal blood flow, increasing diuresis and restoring fluid and electrolyte levels. The increased water content of the urine reduces its specific gravity. Which type of fluid should the nurse expect to prepare and administer as fluid resuscitation during the emergent phase of burn recovery? Although not universally true, most fluid resuscitation for burn injuries starts with crystalloid solutions, such as normal saline and Ringer’s lactate. The burn client rarely requires blood during the emergent phase unless the burn is complicated by another injury that involved hemorrhage. Colloids and plasma are not generally used during the fluid shift phase because these large particles pass through the leaky capillaries into the interstitial fluid, where they increase the osmotic pressure. Increased osmotic pressure in the interstitial fluid can worsen the capillary leak syndrome and make maintaining the circulating fluid volume even more difficult. The client who is burned is drooling and having difficulty swallowing. Which action will the nurse take first? Inhalation injuries are present in 7% of clients admitted to burn centers. Drooling and difficulty swallowing can mean that the client is about to lose his airway because of this injury. The absence of breath sounds over the trachea and mainstem bronchi indicates impending airway obstruction and demands immediate intubation. Knowing the level of consciousness is important to assess oxygenation to the brain. Ascertaining time of last food intake is important in case intubation is necessary (the nurse would be more alert for the signs of aspiration). However, assessing for air exchange is the most important intervention at this time. Measuring abdominal girth is not relevant in this situation. The nurse provides wound care for a client 48 hours after a burn injury. To achieve the desired outcome of the procedure, which nursing action will be carried out first? All steps are part of the nonsurgical wound care for clients with burn injuries. The first step in this process is removing exudates and necrotic tissue. The newly admitted client has a large burned area on the right arm. The burned area appears red, has blisters, and is very painful. How should this injury be categorized? The characteristics of the wound meet the criteria for a superficial partialthickness injury (color that is pink or red; blisters; pain present and high). Which finding is characteristic during the emergent period after a deep full thickness burn injury? During the fluid shift of the emergent period, blood flow to the kidney may not be adequate for glomerular filtration. As a result, urine output is greatly decreaseD. Foul-smelling discharge does not occur during the emergent phase and blood pressure is usually low. Pain does not occur with deep full-thickness burns. Which finding indicates to the nurse that the client understands the psychosocial impact of his severe burn injury? During the recovery period, and for some time after discharge from the hospital, clients with severe burn injuries are likely to have psychological problems that require intervention. Depression is one of these problems. Feelings of grief, loss, anxiety, anger, fear, and guilt are all normal feelings that can occur. Clients need to know that problems of physical care and psychological stresses may be overwhelming. The client has experienced an electrical injury of the lower extremities. Which are the priority assessment data to obtain from this client? The airway is not at any particular risk with this injury. Therefore, respiratory rate and pulse oximetry are not priority assessments. Electric current travels through the body from the entrance site to the exit site and can seriously damage all tissues between the two sites. Early cardiac damage from electrical injury includes irregular heart rate, rhythm, and ECG changes. Range of motion and neurologic assessments are important. However the priority is to make sure that the heart rate and rhythm are adequate to support perfusion to the brain and other vital organs. The client with facial burns asks the nurse if he will ever look the same. Which response is best for the nurse to provide? Many clients have unrealistic expectations of reconstructive surgery and envision an appearance identical or equal in quality to the preburn state. Pressure dressings prevent further scarring. They cannot remove scars. The client and family should be taught the expected cosmetic outcomes. The newly admitted client has burns on both legs. The burned areas appear white and leather-like. No blisters or bleeding are present, and the client states that he or she has little pain. How should this injury be categorized? The characteristics of the wound meet the criteria for a full-thickness injury (color that is black, brown, yellow, white or red; no blisters; pain minimal; outer layer firm and inelastic). The client has a large burned area on the right arm. The burned area appears pink, has blisters, and is very painful. How will the nurse categorize this injury? The characteristics of the wound meet the criteria for a superficial partial-thickness injury: color that is pink or red; blisters and pain present. Blisters are not seen with full-thickness and superficial burns, and are rarely seen with deep partial-thickness burns. Deep partial-thickness burns are red to white in color. What additional laboratory test should be performed on any African American client who sustains a serious burn injury? Sickle cell disease and sickle cell trait are more common among African Americans. Although clients with sickle cell disease usually know their status, the client with sickle cell trait may not. The fluid, circulatory, and respiratory alterations that occur in the emergent phase of a burn injury could result in decreased tissue perfusion that is sufficient to cause sickling of cells, even in a person who only has the trait. Determining the client’s sickle cell status by checking the percentage of hemoglobin S is essential for any African American client who has a burn injury. The client has severe burns around the right hip. Which position is most important to be emphasized by the nurse that the client maintain to retain maximum function of this joint? Maximum function for ambulation occurs when the hip and leg are maintained at full extension with neutral rotation. Although the client does not have to spend 24 hours at a time in this position, he or she should be in this position (in bed or standing) more of the time than with the hip in any degree of flexion. Which assessment finding assists the nurse in confirming inhalation injury? Brassy cough and wheezing are some signs seen with inhalation injury. All the other symptoms are seen with carbon monoxide poisoning. A female client is brought to the emergency department with second- and third-degree burns on the left arm, left anterior leg, and anterior trunk. Using the Rule of Nines, what is the total body surface area that has been burned? The Rule of Nines divides body surface area into percentages that, when totaled, equal 100%. According to the Rule of Nines, the arms account for 9% each, the anterior legs account for 9% each, and the anterior trunk accounts for 18%. Therefore, this client’s burns cover 36% of the body surface area. Which finding indicates to the nurse that a client with a burn injury has a positive perception of his appearance? Indicators that the client with a burn injury has a positive perception of his appearance includes the willingness to touch the affected body part. Self-care activities such as morning care foster feelings of self-worth, which are closely linked to body image. Allowing others to change the dressing and discussing future reconstruction would not indicate a positive perception of appearance. Wearing the dressing will assist in decreasing complications, but will not increase self-perception. When planning care for a male client with burns on the upper torso, which nursing diagnosis should take the highest priority? When caring for a client with upper torso burns, the nurse’s primary goal is to maintain respiratory integrity. Therefore, option A should take the highest priority. Option B isn’t appropriate because burns aren’t a disease. Option C and D may be appropriate, but don’t command a higher priority than option A because they don’t reflect immediately life-threatening problems. In reviewing the burned client's laboratory report of white blood cell count with differential, all the following results are listed. Which laboratory finding indicates the possibility of sepsis? The total white blood cell count is 9000/mm3. The lymphocytes outnumber the basophils. The monocyte count is 1,800/mm3. Normally, the mature segmented neutrophils (“segs”) are the major population of circulating leukocytes, constituting 55% to 70% of the total white blood count. Fewer than 3% to 5% of the circulating white blood cells should be the less mature “band” neutrophils. A left shift occurs when the bone marrow releases more immature neutrophils than mature neutrophils. Such a shift indicates severe infection or sepsis, in which the client’s immune system cannot keep pace with the infectious process. Which intervention is most important to use to prevent infection by autocontamination in the burned client during the acute phase of recovery? Changing gloves between wound care on different parts of the client's body. Avoiding sharing equipment such as blood pressure cuffs between clients. Using the closed method of burn wound management. Using proper and consistent handwashing. Autocontamination is the transfer of microorganisms from one area to another area of the same client's body, causing infection of a previously uninfected area. Although all techniques listed can help reduce the risk for infection, only changing gloves between carrying out wound care on difference parts of the client’s body can prevent autocontamination. A client who is admitted after a thermal burn injury has the following vital signs: blood pressure, 70/40; heart rate, 140 beats/min; respiratory rate, 25/min. He is pale in color and it is difficult to find pedal pulses. Which action will the nurse take first? Check the pulses with a Doppler device. Obtain a complete blood count (CBC). Hypovolemic shock is a common cause of death in the emergent phase of clients with serious injuries. Fluids can treat this problem. An ECG and CBC will be taken to ascertain if a cardiac or bleeding problem is causing these vital signs. However these are not actions that the nurse would take immediately. Checking pulses would indicate perfusion to the periphery but this is not an immediate nursing action. When providing care for a client with an acute burn injury, which nursing intervention is most important to prevent infection by autocontamination? Autocontamination is the transfer of microorganisms from one area to another area of the same client’s body, causing infection of a previously uninfected area. Although all techniques listed can help reduce the risk for infection, only changing gloves between carrying out wound care on different parts of the client’s body can prevent autocontamination. Which statement made by the client with facial burns who has been prescribed to wear a facial mask pressure garment indicates correct understanding of the purpose of this treatment? The purpose of wearing the pressure garment over burn injuries for up to 1 year is to prevent hypertrophic scarring and contractures from forming. Scars will still be present. Although the mask does provide protection of sensitive newly healed skin and grafts from sun exposure, this is not the purpose of wearing the mask. The pressure garment will not change the angle of ear attachment to the head. The client has burns on both legs. These areas appear white and leather-like. No blisters or bleeding are present, and there is just a “small amount of pain.” How will the nurse categorize this injury? The characteristics of the wounds meet the criteria for a full-thickness injury: color that is black, brown, yellow, white, or red; no blisters; pain minimal; outer layer firm and inelastiC. Partial-thickness superficial burns appear pink to red in color, with pain. Partial-thickness burn color is deep red to white in color with pain, and superficial burn color is pink to red, with pain. Which statement indicates that a client with facial burns understands the need to wear a facial pressure garment? The purpose of wearing the pressure garment over burn injuries for up to 1 year is to prevent hypertrophic scarring and contractures from forming. Scars will still be present. Although the mask does provide protection of sensitive, newly healed skin and grafts from sun exposure, this is not the purpose for wearing the mask. The pressure garment will not alter the risk for infection. Twelve hours after the client was initially burned, bowel sounds are absent in all four abdominal quadrants. Which is the nurse’s best action? Decreased or absent peristalsis is an expected response during the emergent phase of burn injury as a result of neural and hormonal compensation to the stress of injury. No currently accepted intervention changes this response. It is not the highest priority of care at this time. The burned client newly arrived from an accident scene is prescribed to receive 4 mg of morphine sulfate by IV push. What is the most important reason to administer the opioid analgesic to this client by the intravenous route? The medication will be effective more quickly than if given intramuscularly. It is less likely to interfere with the client’s breathing and oxygenation. The danger of an overdose during fluid remobilization is reduced. The client delayed gastric emptying. Which is the priority nursing diagnosis during the first 24 hours for a client with chemical burns to the legs and arms that are red in color, edematous, and without pain? During the emergent phase, fluid shifts into interstitial tissue in burned areas. When the burn is circumferential on an extremity, the swelling can compress blood vessels to such an extent that circulation is impaired distal to the injury, causing decreased tissue perfusion and necessitating the intervention of an escharotomy. Chemical burns do not cause inhalation injury and a disrupted breathing pattern. Disturbed body image and disuse syndrome can develop. However, these are not priority diagnoses at this time. Which laboratory result, obtained on a client 24 hours post-burn injury, will the nurse report to the physician immediately? The serum potassium level is changed to the degree that serious life-threatening responses could result. With such a rapid rise in the potassium level, the client is at high risk for experiencing severe cardiac dysrhythmias and death. All the other findings are abnormal, but not to the same degree of severity, and would be expected in the emergent phase after a burn injury. Which finding indicates that fluid resuscitation has been successful for a client with a burn injury? The fluid remobilization phase improves renal blood flow, increases diuresis, and restores blood pressure and heart rate to more normal levels, as well as laboratory values. What is the priority nursing diagnosis for a client in the rehabilitative phase of recovery from a burn injury? Recovery from a burn injury requires a lot of work on the part of the client and significant others. Seldom is the client restored to the preburn level of functioning. Adjustments to changes in appearance, family structure, employment opportunities, role, and functional limitations are only a few of the numerous life-changing alterations that must be made or overcome by the client. By the rehabilitation phase, acute pain from the injury or its treatment is no longer a problem. Which statement best exemplifies the client’s understanding of rehabilitation after a full-thickness burn injury? Although a return to pre-burn functional levels is rarely possible, burned clients are considered fully recovered or rehabilitated when they have achieved their highest possible level of physical, social, and emotional functioning. The technical rehabilitative phase of rehabilitation begins with wound closure and ends when the client returns to her or his highest possible level of functioning. At what point after a burn injury should the nurse be most alert for the complication of hypokalemia? Hypokalemia is most likely to occur during the fluid remobilization period as a result of dilution, potassium movement back into the cells, and increased potassium excreted into the urine with the greatly increased urine output. The burned client on admission is drooling and having difficulty swallowing. What is the nurse’s best first action? Assess level of consciousness and pupillary reactions. Ask the client at what time food or liquid was last consumed. Auscultate breath sounds over the trachea and mainstem bronchi. Measure abdominal girth and auscultate bowel sounds in all four quadrants. Difficulty swallowing and drooling are indications of oropharyngeal edema and can precede pulmonary failure. The client’s airway is in severe jeopardy and intubation is highly likely to be needed shortly. Three days after a burn injury, the client develops a temperature of 100° F, white blood cell count of 15,000/mm3, and a white, foul-smelling discharge from the wound. The nurse recognizes that the client is most likely exhibiting symptoms of which condition? Color change, purulent, foul-smelling drainage, increased white blood cell count, and fever could all indicate infection. These symptoms will not be seen in the acute phase of the injury. Autodigestion of collagen and granulation of tissue will not increase the body temperature or cause foul-smelling wound discharge. What clinical manifestation indicates that an escharotomy is needed on a circumferential extremity burn? The burn is full thickness rather than partial thickness. The client is unable to fully pronate and supinate the extremity. Capillary refill is slow in the digits and the distal pulse is absent. The client cannot distinguish the sensation of sharp versus dull in the extremity. Circumferential eschar can act as a tourniquet when edema forms from the fluid shift, increasing tissue pressure and preventing blood flow to the distal extremities and increasing the risk for tissue necrosis. This problem is an emergency and, without intervention, can lead to loss of the distal limb. This problem can be reduced or corrected with an escharotomy. On assessment, the nurse notes that the client has burns inside the mouth and is wheezing. Several hours later, the wheezing is no longer heard. What is the nurse’s next action? Clients with severe inhalation injuries may sustain such progressive obstruction that they may lose effective movement of air. When this occurs, wheezing is no longer heard and neither are breath sounds. The client requires the establishment of an emergency airway. The swelling usually precludes intubation. The client with a dressing covering the neck is experiencing some respiratory difficulty. What is the nurse’s best first action? Document the observation as the only action. How will the nurse position a client with a burn wound to the posterior neck to prevent contractures? Have the client turn the head from side to side. Keep the client in a semi-Fowler’s position with her or his arms elevated. Place a towel roll under the client’s neck or shoulder. The function that would be disrupted by a contracture to the posterior neck is flexion. Moving the head from side to side prevents such a loss of flexion. The other distractors listed do not call for moving of the head from side to side. This movement is what would prevent contractures from occurring. The burned client is ordered to receive intravenous cimetidine, an H2 histamine blocking agent, during the emergent phase. When the client's family asks why this drug is being given, what is the nurse’s best response? In assessing the client's potential for an inhalation injury as a result of a flame burn, what is the most important question to ask the client on admission? The risk for inhalation injury is greatest when flame burns occur indoors in small, poorly ventilated rooms. although smoking increases the risk for some problems, it does not predispose the client for an inhalation injury. Twelve hours after the client was initially burned, bowel sounds are absent in all four abdominal quadrants. What is the nurse’s best action? Reposition the client onto the right side. Document the finding as the only action. Increase the IV flow rate. Decreased or absent peristalsis is an expected response during the emergent phase of burn injury as a result of neural and hormonal compensation to the stress of injury. No currently accepted intervention changes this response, and it is not the highest priority of care at this time. Which information obtained by assessment ensures that the client's respiratory efforts are currently adequate? The client is able to talk. The client is alert and oriented. The client's oxygen saturation is 97%. Clients may have ineffective respiratory efforts and gas exchange even though they are able to talk, have good respiratory movement, and are alert. The best indicator for respiratory effectiveness is the maintenance of oxygen saturation within the normal range. What intervention will the nurse implement to reduce a client’s pain after a burn injury? Administering morphine 4 mg intravenously. Administering hydromorphone (Dilaudid) 4 mg intramuscularly. Drug therapy for pain management requires opioid and nonopioid analgesics. The IV route is used because of problems with absorption from the muscle and stomach. Tactile stimulation can be used for pain management. For the client to avoid shivering, the room must be kept warm and heat should be applied. Which intervention is most important for the nurse to use to prevent infection by cross-contamination in the client who has open burn wounds? Cross-contamination occurs when microorganisms from another person or the environment are transferred to the client. Although all the interventions listed above can help reduce the risk for infection, only handwashing can prevent crosscontamination. The nurse is conducting a home safety class. It is most important for the nurse to include which information in the teaching plan? Have chimneys swept every 2 years. Keep a smoke detector in each bedroom. Use space heaters instead of gas heaters. Use carbon monoxide detectors only in the garage. Everyone should use smoke detectors and carbon monoxide detectors in their home environment (just not in a garage). Recommendations are that each bedroom have a separate smoke detector. Space heaters can be a cause of fire if clothing, bedding, and other flammable objects are nearby. Respiratory difficulty can arise from external pressure. The first action in this situation would be to loosen the dressing and then reassess the client’s respiratory status. The client with a new burn injury asks the nurse why he is receiving intravenous cimetidine (Tagamet). What is the nurse’s best response? Ulcerative gastrointestinal disease may develop within 24 hours after a severe burn as a result of increased hydrochloric acid production and decreased mucosal barrier. This process occurs because of the sympathetic nervous system stress response. Cimetidine inhibits the production and release of hydrochloric acid. Cimetidine does not affect intestinal movement, prevent hypovolemic shock, or prevent kidney damage. All of the following laboratory test results on a burned client's blood are present during the emergent phase. Which result should the nurse report to the physician immediately? All these findings are abnormal; however, only the serum potassium level is changed to the degree that serious, life-threatening responses could result. With such a rapid rise in the potassium level, the client is at high risk for experiencing severe cardiac dysrhythmias and death. Changing gloves between wound care on different parts of the client’s body. What clinical manifestation should alert the nurse to possible carbon monoxide poisoning in a client who experienced a burn injury during a house fire? The saturation of hemoglobin molecules with carbon monoxide and the subsequent vasodilation induces a “cherry red” color of the mucous membranes in these clients. The other manifestations are associated with inhalation injury, but not specifically carbon monoxide poisoning. A client who was burned has crackles and a respiratory rate of 40/min, and is coughing up blood-tinged sputum. What action will the nurse take first? Pulmonary edema can result from fluid resuscitation given for burn treatment. This can occur even in a young healthy person. Placing the client in the upright position can relieve the lung congestion immediately before other measures can be carried out. Digoxin may be given later to increase cardiac contractility to prevent backup of fluid into the lungs. Chest physiotherapy will not get rid of fluid. Monitoring urine output is important. However it is not an immediate intervention. A male client comes to the physician’s office for treatment of severe sunburn. The nurse takes this opportunity to discuss the importance of protecting the skin from the sun’s damaging rays. Which instruction would best prevent skin damage? Sunscreen should be applied even on overcast days, because the sun’s rays are as damaging then as on sunny days. The sun is strongest from 10 a.m. to 2 p.m. (11 a.m. to 3 p.m. daylight saving time) — not from 1 to 4 p.m. Sun exposure should be minimized during these hours. The nurse should recommend sunscreen with a sun protection factor of at least 15. Sitting in the shade when at the beach doesn’t guarantee protection against sunburn because sand, concrete, and water can reflect more than half the sun’s rays onto the skin. A client is admitted to the hospital following a burn injury to the left hand and arm. The client’s burn is described as white and leathery with no blisters. Which degree of severity is this burn? On admission to the emergency department the burned client's blood pressure is 90/60, with an apical pulse rate of 122. These findings are an expected result of what thermal injury–related response? Intense pain and carbon monoxide poisoning increase blood pressure. Hemorrhage is unusual in a burn injury. The physiologic effect of histamine release in injured tissues is a loss of vascular volume to the interstitial space, with a resulting decrease in blood pressure. Ten hours after the client with 50% burns is admitted, her blood glucose level is 90 mg/dL. What is the nurse’s best action? Ask the client if anyone in her family has diabetes mellitus. Slow the intravenous infusion of dextrose 5% in Ringer's lactate. Neural and hormonal compensation to the stress of the burn injury in the emergent phase increases liver glucose production and release. An acute rise in the blood glucose level is an expected client response and is helpful in the generation of energy needed for the increased metabolism that accompanies this trauma. Which client factors should alert the nurse to potential increased complications with a burn injury? The client is a 26-year-old male. The client has had a burn injury in the past. The burned areas include the hands and perineum. The burn took place in an open field and ignited the client's clothing. Burns of the perineum increase the risk for sepsis. Burns of the hands require special attention to ensure the best functional outcome. Which vitamin deficiency is most likely to be a long-term consequence of a full-thickness burn injury? Skin exposed to sunlight activates vitamin D. Partial-thickness burns reduce the activation of vitamin D. Activation of vitamin D is lost completely in fullthickness burns. In an industrial accident, a male client that weighs 155 lb (70 kg) sustained full-thickness burns over 40% of his body. He’s in the burn unit receiving fluid resuscitation. Which observation shows that the fluid resuscitation is benefiting the client? In a client with burns, the goal of fluid resuscitation is to maintain a mean arterial blood pressure that provides adequate perfusion of vital structures. If the kidneys are adequately perfused, they will produce an acceptable urine output of at least 0.5 ml/kg/hour. Thus, the expected urine output of a 155-lb client is 35 ml/hour, and a urine output consistently above 100 ml/hour is more than adequate. Weight gain from fluid resuscitation isn’t a goal. In fact, a 4-lb weight gain in 24 hours suggests third spacing. Body temperature readings and ECG interpretations may demonstrate secondary benefits of fluid resuscitation but aren’t primary indicators. What statement indicates the client needs further education regarding the skin grafting (allografting)? Factors other than tissue type, such as circulation and infection, influence whether and how well a graft will work. The client should be prepared for the possibility that not all grafting procedures will be successful. The donor sites will be painful after the surgery, there can be scarring in the area where skin is removed for grafting, and the client is still at risk for infection. The nurse uses topical gentamicin sulfate (Garamycin) on a client’s burn injury. Which laboratory value will the nurse monitor? Gentamicin is nephrotoxic and sufficient amounts can be absorbed through burn wounds to affect kidney function. Any client receiving gentamicin by any route should have kidney function monitoreD. Topical gentamicin will not affect the red blood cell count or sodium or magnesium level. The client has experienced an electrical injury, with the entrance site on the left hand and the exit site on the left foot. What are the priority assessment data to obtain from this client on admission? The airway is not at any particular risk with this injury. Electric current travels through the body from the entrance site to the exit site and can seriously damage all tissues between the two sites. Early cardiac damage from electrical injury includes irregular heart rate, rhythm, and ECG changes. Which of the following statements reflect the nursing management of the patient with a white phosphorus chemical burn? Do not apply water to the burn. Immediately drench the skin with running water from a shower, hose or faucet. Alternate applications of water and ice to the burn. Wash off the chemical using warm water, then flush the skin with cool water. Water should not be applied to burns from lye or white phosphorus because of the potential for an explosion or deepening of the burn. The client who experienced an inhalation injury 6 hours ago has been wheezing. When the client is assessed, wheezes are no longer heard. What is the nurse’s best action? Loosen the dressings on the chest. Document the findings as the only action. Clients with severe inhalation injuries may sustain such progressive obstruction that they may lose effective movement of air. When this occurs, wheezing is no longer heard and neither are breath sounds. The client requires the establishment of an emergency airway and the swelling usually precludes intubation. A client received burns to his entire back and left arm. Using the Rule of Nines, the nurse can calculate that he has sustained burns on what percentage of his body? What statement by the client indicates the need for further discussion regarding the outcome of skin grafting (allografting) procedures? Factors other than tissue type, such as circulation and infection, influence whether and how well a graft “takes.” The client should be prepared for the possibility that not all grafting procedures will be successful. Which statement by the client indicates correct understanding of rehabilitation after burn injury? Although a return to preburn functional levels is rarely possible, burned clients are considered fully recovered or rehabilitated when they have achieved their highest possible level of physical, social, and emotional functioning. In an industrial accident, client who weighs 155 lb (70.3 kg) sustained full-thickness burns over 40% of his body. He’s in the burn unit receiving fluid resuscitation. Which observation shows that the fluid resuscitation is benefiting the client? A urine output consistently above 100 ml/hour. A weight gain of 4 lb (1.8 kg) in 24 hours. An electrocardiogram (ECG) showing no arrhythmias. In a female client with burns on the legs, which nursing intervention helps prevent contractures? Applying knee splints prevents leg contractures by holding the joints in a position of function. Elevating the foot of the bed can’t prevent contractures because this action doesn’t hold the joints in a position of function. Hyperextending a body part for an extended time is inappropriate because it can cause contractures. Performing shoulder range-of-motion exercises can prevent contractures in the shoulders, but not in the legs. The client, who is 2 weeks postburn with a 40% deep partial-thickness injury, still has open wounds. On taking the morning vital signs, the client is found to have a below-normal temperature, is hypotensive, and has diarrhea. What is the nurse’s best action? Nothing, because the findings are normal for clients during the acute phase of recovery. Increase the temperature in the room and increase the IV infusion rate. Assess the client’s airway and oxygen saturation. Notify the burn emergency team. These findings are associated with systemic gram-negative infection and sepsis. This is a medical emergency and requires prompt attention. Which nursing intervention is likely to be most helpful in providing adequate nutrition while the client is recovering from a thermal burn injury? Clients should request food whenever they think that they can eat, not just according to the hospital’s standard meal schedule. The nurse needs to work with a nutritionist to provide a high-calorie, high-protein diet to help with wound healing. Clients who can eat solid foods should ingest as many calories as possible. Parenteral nutrition may be given as a last resort because it is invasive and can lead to infectious and metabolic complications. Ten hours after the client with 50% burns is admitted, her blood glucose level is 140 mg/dL. What is the nurse’s best action? Neural and hormonal compensation to the stress of the burn injury in the emergent phase increase liver glucose production and release. An acute rise in the blood glucose level is an expected client response and is helpful in the generation of energy needed for the increased metabolism that accompanies this trauma. A family history of diabetes could make her more of a risk for the disease, but this is not a priority at this time. The glucose level is not high enough to warrant retesting. The cause of her elevated blood glucose is not the IV fluid. When assessing a client with partial thickness burns over 60% of the body, which of the following should the nurse report immediately? The client has severe burns around the right hip. Which position is most important to use to maintain maximum function of this joint? Maximum function for ambulation occurs when the hip and leg are maintained at full extension with neutral rotation. Although the client does not have to spend 24 hours in this position, he or she should be in this position (in bed or standing) longer than with the hip in any degree of flexion. A 30-year-old homemaker fell asleep while smoking a cigarette. She sustained severe burns of the face,neck, anterior chest, and both arms and hands. Using the rule of nines, which is the best estimate of total body-surface area burned? 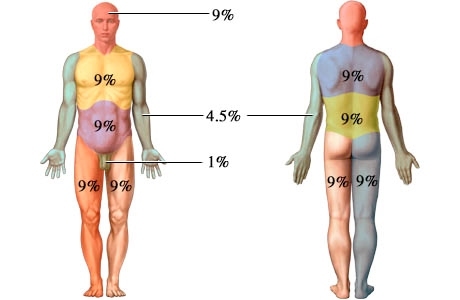 Using the Rule of Nine in the estimation of total body surface burned, we allot the following: 9% – head; 9% – each upper extremity; 18%- front chest and abdomen; 18% – entire back; 18% – each lower extremity and 1% – perineum.